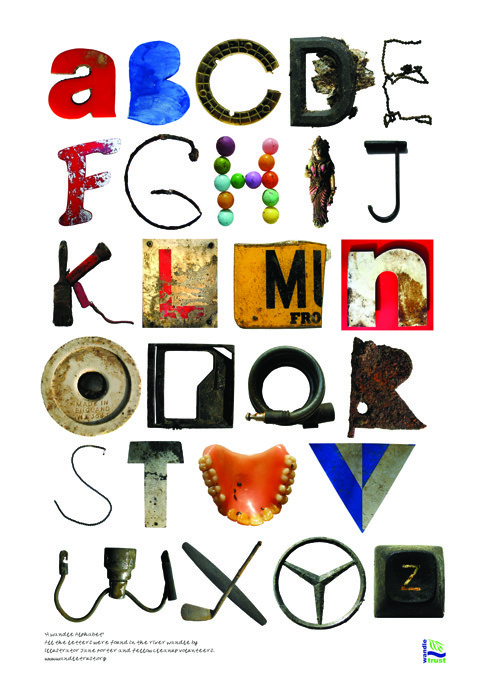 It’s taken five years of wading, rummaging, sifting and heaving but my Wandle alphabet is finally complete – a complete A-Z made with objects found during clean-ups of the river Wandle with the Wandle Trust. I think my favourite has to be the false teeth ‘U’, though I am also very fond of ‘R’ and ‘O’. The ‘F’ is from a fish and chips sign. It’s now available as an A1 sized, limited edition poster – it costs £20 with all proceeds going to future Wandle Trust work. Do email me if you are interested in buying one. This entry was posted in Alphabets, River projects, Typography on November 5, 2011 by Jane Porter. I adore this, Jane! It makes me want to do one as well, especially as spring is a big clean-up time in the woods and waterways around town. Hi Jane – I would love one of these but couldn’t see your email address anywhere? thanks! It’s [email protected] – I think I need to make it more obvious, it’s tucked away in the ‘about’ section!